RO: Stă-n coșul cu proiecte de vreo 3 luni. L-am lucrat într-una din puținele zile senine din iarnă și, pentru că nu mi-a plăcut ceva la el, l-am abandonat în coș. Și-a dat coate cu unicornul hipster, l-a ciupit pe ariciul fără țepi și s-a … mă scuzați, bășit pe puiul guraliv. Mno, ăsta-i DeadPool, un nemernic! L-am terminat zilele trecute, după ce i-am făcut baie – doar, doar i s-or spăla păcatele săvârșite în coșul cu jucării. E mult de muncă pentru o jucărie croșetată DeadPool, așa că înarmează-te și cu răbdare. Ai nevoie de o croșetă de 2 mm, bumbac mercerizat – Catania, Performance, ce găsești la mercerie și se potrivește croșetei de 2 mm, umplutură din melană dărăcită și un pic de material pentru ochi. Jucăriile croșetate se lucrează circular, nu se unește rândul cu picioruș orb decât acolo unde se precizează. Chiar dacă DeadPool e un personaj din benzi desenate și filme, nefiind invenția mea, tutorialul acesta îmi aparține. Ceea ce înseamnă că imaginile și textele sunt ale mele și nu pot fi reproduse pe alte website-uri/bloguri. Și pentru că ne dorim să trăim într-o lume civilizată, îți mulțumesc pentru că precizezi sursa (atelierhandmade.com) atunci când te folosești de acest tutorial pentru a face o jucărie croșetată DeadPool. EN: It’s been 3 months since he’s been sitting in the amigurumi basket. He’s managed to kick the hipster unicorn, bullied the spike-less hedgehog and, excuse my language, has farted on the noisy chicken. He’s DeadPool and he’s a jerk! Finished last week, gave him a bath, trying to wash away the sins made in the amigurumi basket. 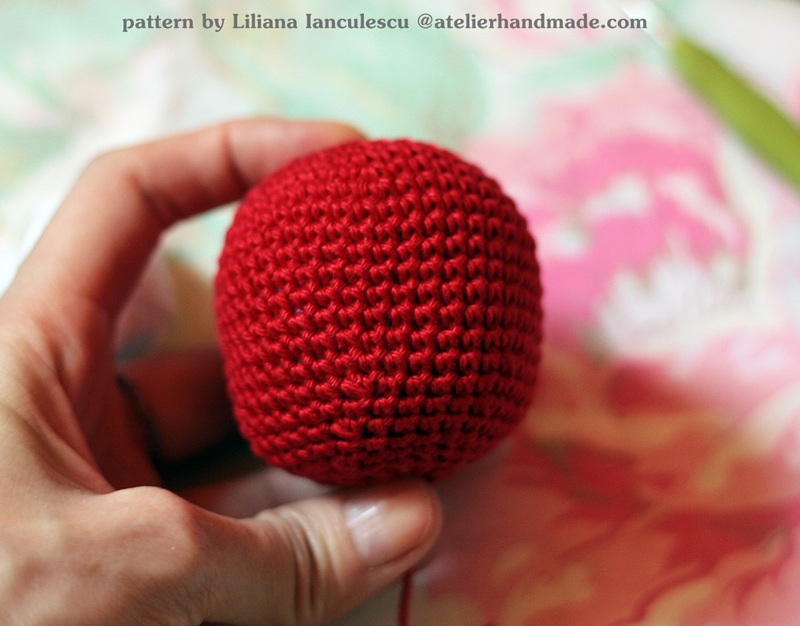 To make this toy you will need: 2 mm hook and mercerized cotton – Catania, Performance, Limoncello, whatever you can find at your yarn store and it’s suitable for a 2 mm hook. Of course, you’ll need red, black and a bit of grey. And a small piece of black fabric for the eyes. 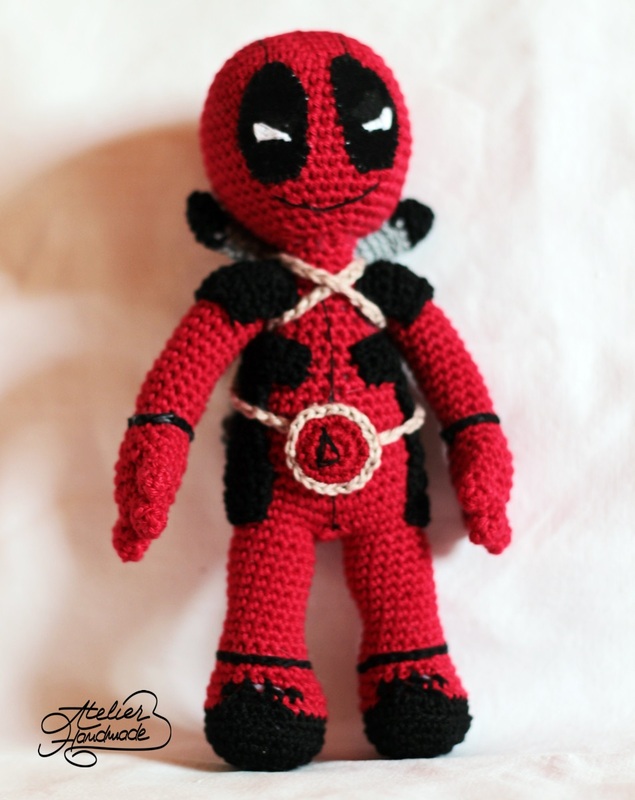 This crochet Deadpool pattern is written using American crochet terminology. 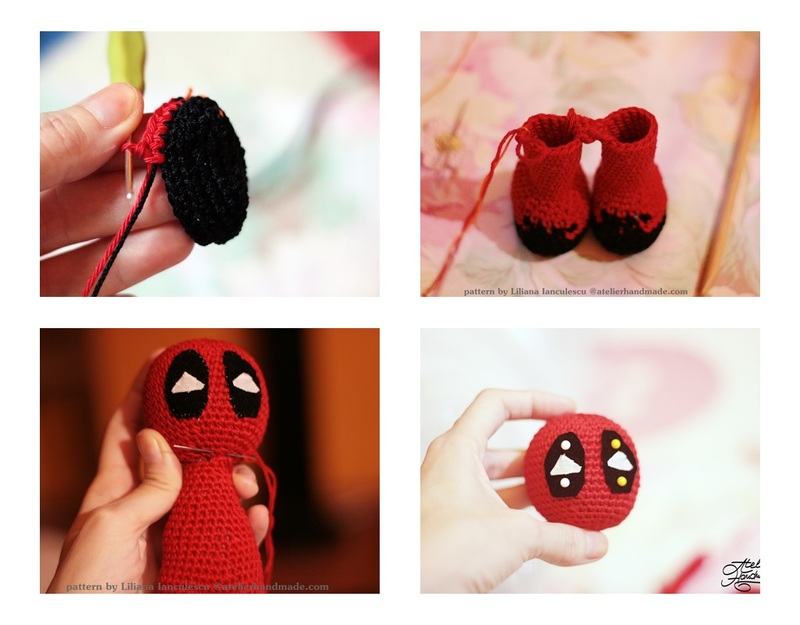 Although DeadPool is not my invention, this pattern – photos and instructions – are mine. And that means you cannot upload it on other websites and you cannot use these photos without my approval. And thank you for giving credit to atelierhandmade.com if you use this pattern to make your own DeadPool. I don’t care if you sell your amigurumi made from my patterns as long as you don’t publish my patterns elsewhere. R4: Primele 4 degete se cos, unul după altul, într-un singur ochi, folosește un marker/ac de siguranță pt a însemna unde ai început rândul. Atașează firul într-o margine și continuă croșetând cu câte 1 sc în fiecare ochi = 16 sc. Sew the first 4 fingers in one ch. Mark the place where you attach your yarn and continue crocheting making 1 sc in each sc = 16 sc. Pașii aceștia se refac pentru al doilea picior. / Follow the same pattern for second leg. Folosește ace pentru a fixa accesoriile pe trup, după ce toate membrele au fost cusute. Inițial voiam să fac partea albă a ochilor cu material, dar la spălat s-a dezlipit. Așa că am ales să-i cos.
Use pins to fix the accessories on the body, after you finished sewing all the other body parts. First I glued the white part of the eyes, but that fabric fell after washing. So I had to embroider the eyes. Poți să le umpli cu melană sau un fir metalic ori poți să le lași așa. Mai ales dacă jucăria va ajunge la un copil. You can stuff the swords with filling or some wire or just leave them like that, especially if the toy will be for a child. Next post: Spring Sale Crochet Patterns! I love love love this pattern, but I can’t understand how to start the legs. Can you give any more details in the beginning? I’m not sure what’s the problem? 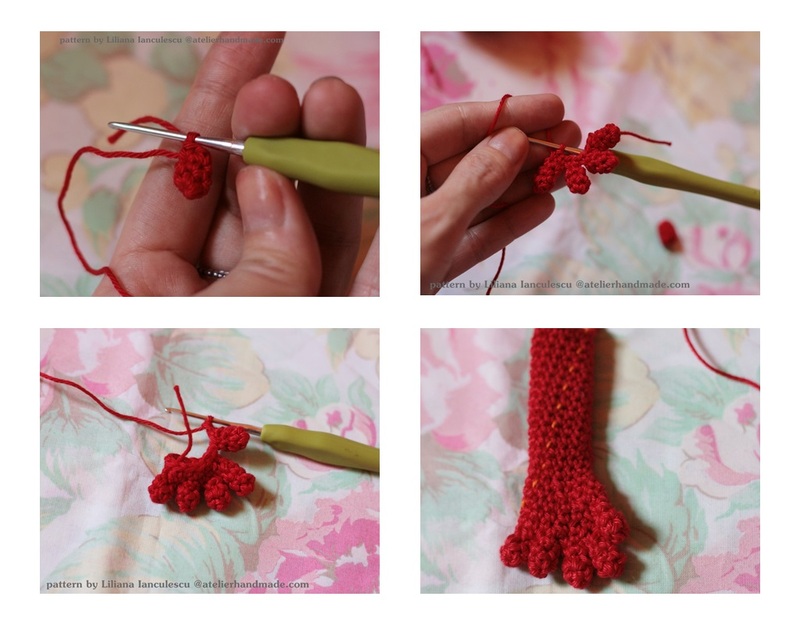 You start the feet with black yarn and on row 6 and row7 you work with both red and black yarn. It would help if you could point out exactly what is you don’t understand. Thanks for the reply. I got it though! How did you do the legs im a little lost if i chain 6 and 2 SC in each im not going to end up with 20. Any help would be great thanks. Also having trouble starting the hands. you work on both sides of the chain. If you chain 6, start working in the second ch from hook, meaning you’ll have 5 stitches on both sides of the chain. If it’s easier to see the stitches, make this instead: ch 6, sc in second ch from hook and 1 sc in the 4 chains left. and work 5 sc on the other side of the chain. And on the next row you make 2 sc in each sc from previous row. So you’ll have 20. I usually skip the first row of 1 sc in each and go straight for the increase row. As for the hands, can you be more specific? After ch 6, then 2sc in second chain from hook then the rest of them. I don’t understand how you get to 20 stitches. I think this is where I’m getting stuck. If it’s easier to see the stitches, make this instead: ch 6, sc in second ch from hook and 1 sc in the 4 chains left. then work on the other side of the chain and make 1 sc in each 5 chains. You will have 5 sc on one side and 5 sc on the other side, so 10 sc. And on the next row you make 2 sc in each sc from previous row. So you’ll have 20. I usually skip the first row of 1 sc in each and go straight for the increase row. Thankyou for that it makes more sense now. As for the hands im having trouble with the start making the fingers do i put the 4 SC in the ch 2 to make the first finger but then im confused when it has 4sc/row. Love the project by the way think you have done a fantastic job. Because the end project is not big, the fingers must be small to have some sort of balance. Yes, you make 5 separate fingers then join 4 of them by either sewing each other in 1 single stitch or sl st in on stitch. See picture where I show how the first 4 fingers look joined. Im very lost when attaching the 5th finger. R6: Isnt it suppose to be 7sc+4sc+7sc? If you’re left with 15 sc, it’s no big deal. Just sc2tog on the next row and you’ll get to the right amount of stitches. Im so confused on the fingers. I chained two, did 4 sc, chained 5 then did 4 sc back down the chn skipping the first then slip stiched at the bottom. Im just trying to figure this out. Please help! I love this pattern! I’m currently making this for a Christmas gift for a friend and I’m a little stuck. The chain like thing that holds the swords and has the circle thing? I don’t see any instructions for it, unless I’m over looking them. If you could please explain how to make it, I would be very thankful. I kinda winged it from the picture. Make a red circle like you would starting the head. Total 18sc after 3 rounds. Then make a black circle. Total 12 sc after 2 rounds. Sew them together. Then use a buff color to sl st around the circle. Then chain….I think 200….just so it would wrap around the back of the neck, come down under the arms, around the swords and back to the other side of the circle. Then sew the circle onto the belly of the body. This pattern is great! I made one, posted the picture, got two more commission jobs from it. I really like it. Thanks for doing this for us. How do you make eyes? I don’t find the explain. I just sew. I tried two ways: using black and white felt fabric. Second method: cut 2 black oval shapes and after I sewed these onto the head, I got the needle and white thread and started sewing lines close together to resemble the shape of eyes. You can see in the pictures. And found that I like this method best. Just try and improvise, this is the beauty of crochet toys. You can always try different methods. Do you have a pattern for the unicorn as well?